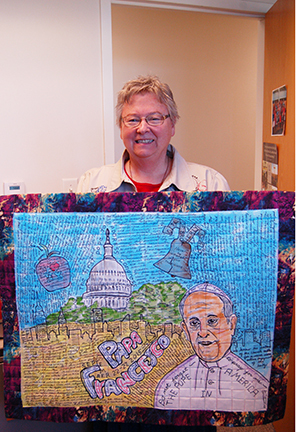 Pope Francis Art Quilt Commemorates Visit to the U.S.
To celebrate the historic visit of Pope Francis to the United States (Sept. 22-27, 2015), Sister Nancy Gunderson created this gorgeous art quilt which contains excerpts from the Pope's speeches to Congress, the United Nations and at Independence Hall in Philadelphia. Quotes from the synod on the family are woven throughout. The skyline contains quotes from people on the streets. Sister Nancy says this was created using fabric paint/markers/pens on white cotton. It is a contemporary folk-art quilt. The quilting preserves the art and captures historic moments.